Post your Centurion Ironman.. For the love of 80s paint jobs! 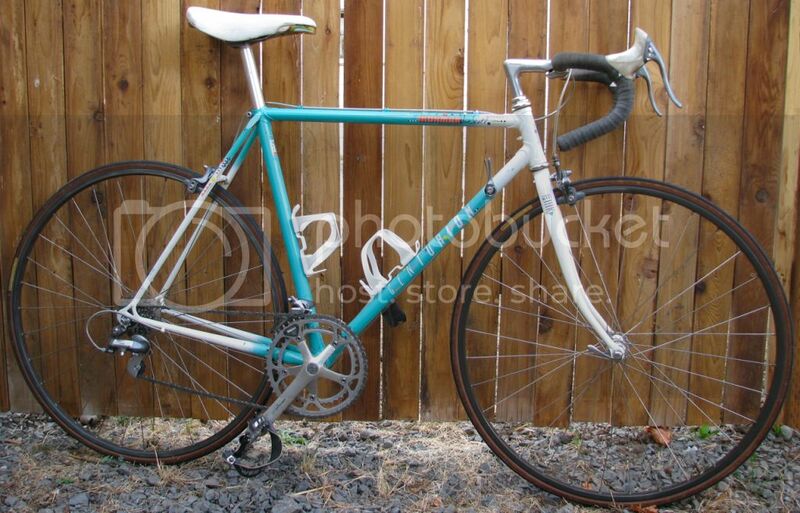 89 Ceturion Ironman Master(White/Gray marble)...all original except saddle and of course new tires and bar tape. It's a 60cm. I have been using it until lately as my indoor trainer bike. It rides great...but does have some rust on TT because of sweat. Very upsetting. I should of known better. Anyway....Is there a way to get rid of the rust and re-paint? Or is it too much trouble. Any ideas as to do what to do with it would be greatly appreciated. Sorry no pics as of this time. Very well put. That has the pedigree, and one of the wilder paint jobs. Seems like the Panasonics, Paramounts and the D'backs were trying to outdo each other with that stuff. Your approach to doing what it takes to make it work for you is straight up. Welcome to the forum. Horatio beat me to it. Sorry if our enthusiasm has driven the price up, but it's worth the touchups, etc. Based on what I have read up and researched, it's an 86' model. I hope its an 86' model. That's the year my wifey was born. That's pretty cool. Is she tired of the jokes yet? Not sure about the rest. The serial is N6A6988, not sure if that will help or not. The pictures actually make it look nicer than it is, it's kinda banged and beat up. I'm worried bout rust and stuff, but I'm not sure if I should be or not. It's my 1st real road bike and man do I love riding it. 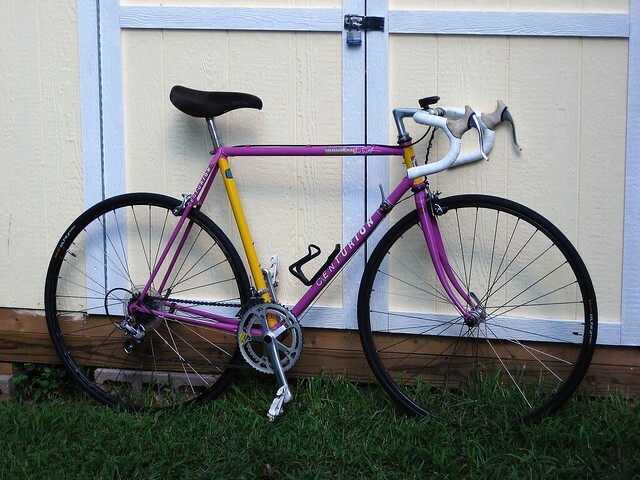 My other bike is a no name fixie, nothing special other than a Sugino 75 chainring. Anyways, here's the specs and pics I saved from the CL listing. COMPLETE SET OF SHIMANO 600 COMPONENTS! BTW, those tubes are not new. The schrader valve was rusted and gunked up. New saddle, tires and bar tape tho. But that saddle hurts. I don't really like that the brake hoods are kinda loose. It's dia compe hoods. Also, not sure if brake levers are Shimano, but then again I'm a noob. 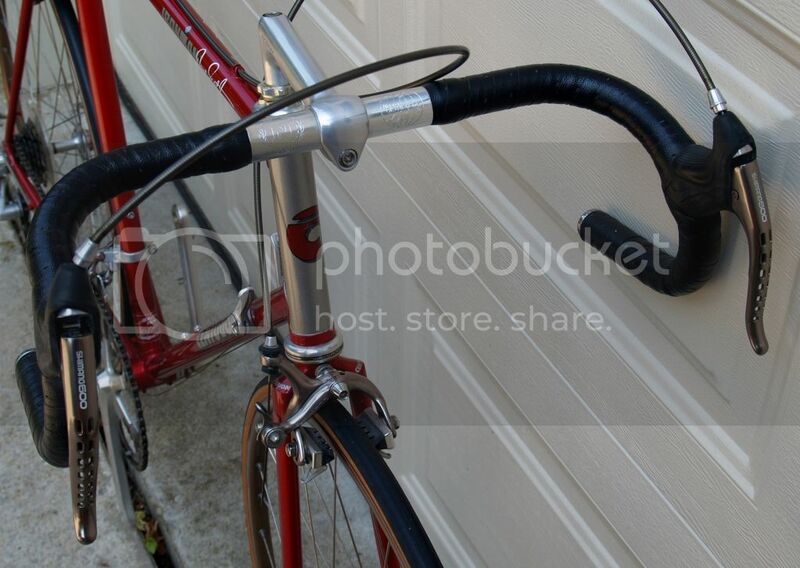 Brake levers should be Dia Compe's, so the hoods should be, too. They're available, still, in black, red, etc. Any help or info, just chime in and I will definitely appreciate it. I want to make this bike better and a beast. I mean, it's already a beast, but I wanna make it betterrrrr. So far I'm loving my Ironman. Glad to know the bike is still winning people over. Welcome to the forum, too! Rustoleum makes a rust remover, sold at Walmart for about $6 in the auto body section. Basically a naval jelly, or something. Works great with a toothbrush, just apply, let it sit a bit, then rinse. After that, you can prime it with some Rustoleum or something close, and then turn to touchup paint. Testor's white pens for big stuff, Sharpie paint pens in medium and fine point work, too. I've gone ahead and gotten a clear touchup pen lately for some touchup I did on an older frame, but clear nail polish will help "hold" the touchup, too. If you get more ambitious, you can try primer, then a few layers of touchup, then rubbing compound to get it smooth, then some clear spray (Duplicolor, or some hobby sprays), and then some compound and wax.... For that model, there is a Ford grey that works pretty well in the marbled areas. 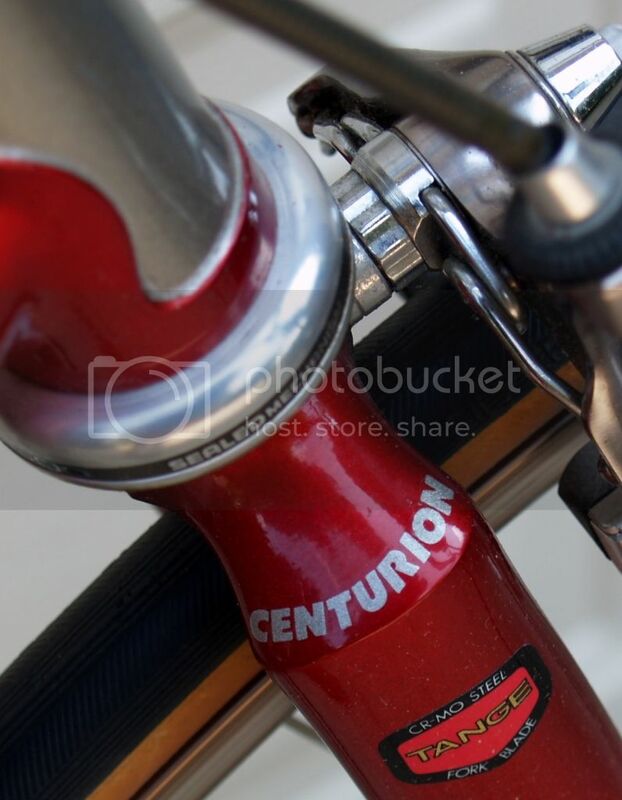 Welcome to the forum, and thanks for posting; I think you'll find a kindred spirit in cehowardGS, on his Centurion Ironman thread....http://www.bikeforums.net/showthread...urion-Ironmans. That 600 tricolor group looks great with that marbled grey background. A.K.A. the "Hard Rock" Ironman. Last edited by RobbieTunes; 04-12-12 at 04:33 PM. It is an '86 - 600EX group and fork crown confirm. The paint should touch up nicely with Testor's model paints. I got the best results on mine with a coat of white first, then red on top. Treat the rust (if any) first. You'll find it's a great bike. Yea, I totally fell in love with it the moment I saw it in person. After the initial ride, couldn't be happier. Thanks for the info Horatio and Robbie. I plan on touching up the paint and to try and make it look cleaner. So from what I gather, Walmart has a rust remover that works, then I prime with something and I follow with touch up paint. Right right? 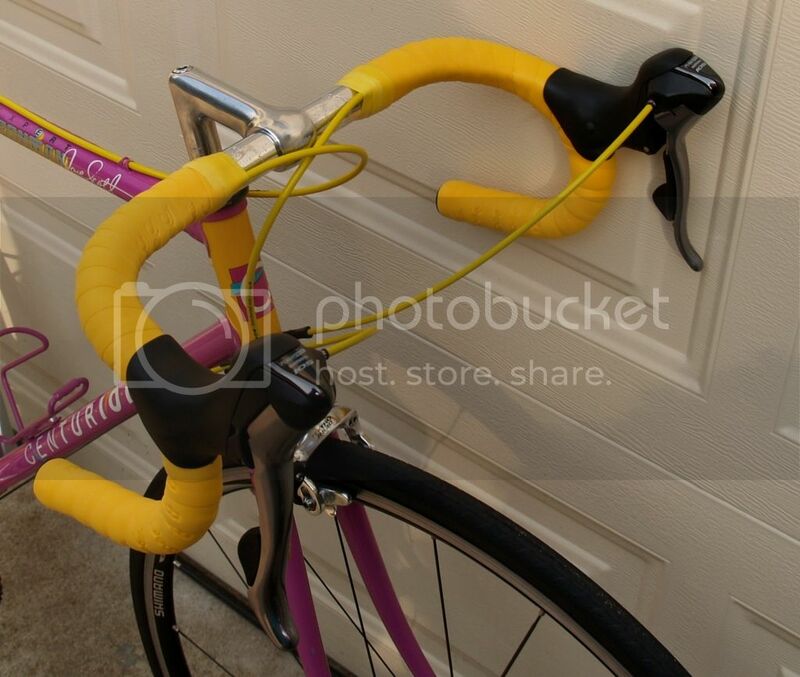 It is Dia-Compe brake levers, Robbie you was right. It has a stamp in white on the front that says AGC. Are there any readily available hoods that fit snugs? There's a small dent on the top tube. Is there an easy fix for this? It's right after the middle cable holding thingy. Will keep you guys updated as I fix her up. Yes, you're Right right on the paint thing. AGC = Aero Gran Compe, I thinke. The hoods should fit pretty well, run about $15/set I think. Not sure about dents. I leave them alone, a place to keep my gum while I ride. Others here know about them; do a search on the topic. It has much better wheels and tires on it now. The front is actually an Ambrosio but the spokes are not in great shape. You are an excellent brother. 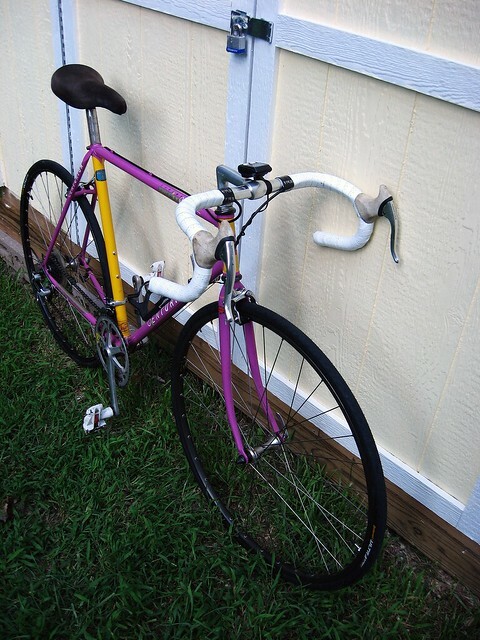 Posted a couple of weeks ago about a customer wanting to have me build a short-ish tri-style vintage/classy bike for his daughter. The finished product: a Miami Vice Iron Man. 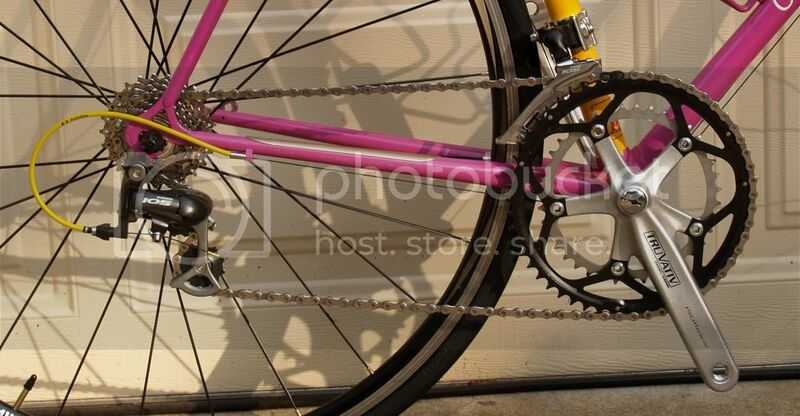 10 speed double (love them Truvativ square taper cranksets! ), Vittoria Pro's, Shimano R500 wheelset, new Selle Italia XO saddle, really a very nice bike. I opted not to take any detail shots yet since the bike needs a good cleaning first (she's in fantastic shape, just a little dirty). I've only ridden it around the LBS parking lot and around the neighborhood a couple times, but I absolutely love it so far. Already have my mind set on finding a white/grey marble Master at some point in the future. Last edited by kaydub; 08-01-12 at 11:11 AM. I recently purchased an Ironman from a guy who had it stolen and recovered twice, which is about the luckiest thing I've heard in a long time. Anyway, the first time it was stolen it was rattlecanned red, the second time it was rattlecanned blue. The owner, who bought it in the early 90's, tried getting some of the spray paint off, but didn't get the hard to reach areas, and unfortunately the other areas were sanded a bit to vigorously. Anyway, could anyone tell me where I would find the serial number so I don't have to go searching under two layers of paint a bunch of times? Pics to come soon. 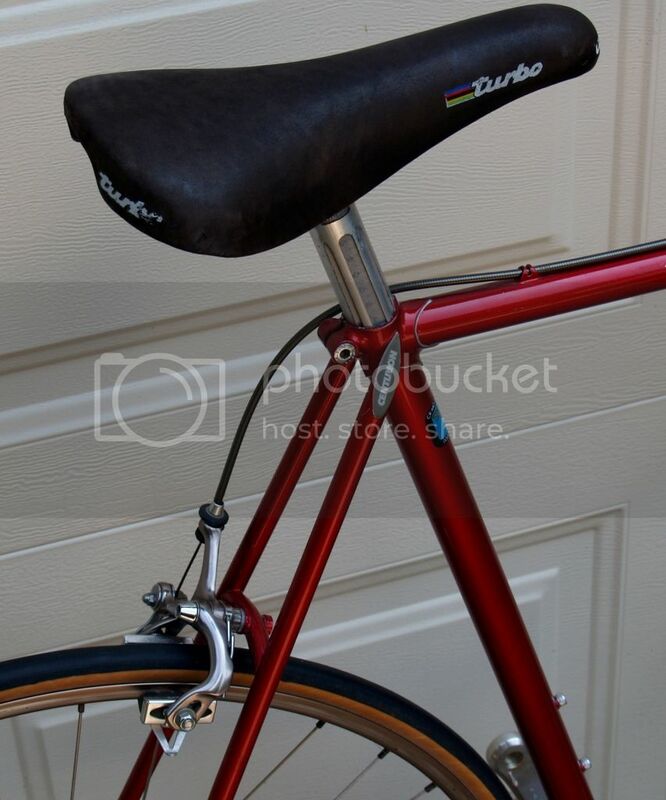 Looking to swap the saddle for something white and period correct, to match the bars/hoods and pedals. I've got a white San Marco Regal on mine, and it looks right. 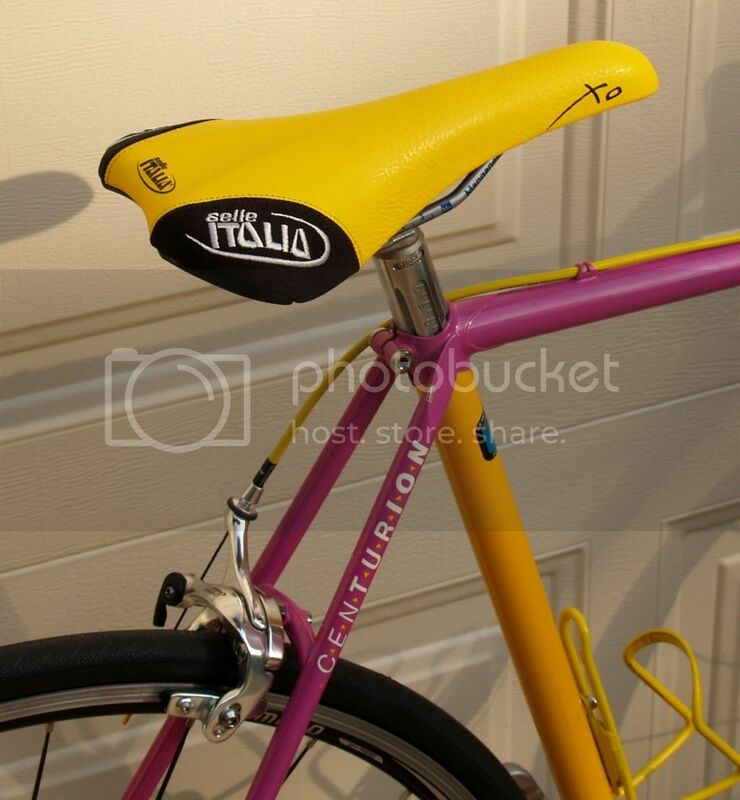 Hmm, that's a nice saddle, but I'm not too keen on the rivets. Just seems a little too classic for a Miami Vice IMO. But, thanks to your suggestion, I'm now quite interested in finding a used or NOS Concor Supercorsa. So thank you anyways! My '87. Got the frame & fork in trade for my '90 Bottecchia ADR from another BFer in the "frame doesn't fit" thread last year, finally finished building it up recently, still getting the fit right. Full '90 105 group save the FD, which I think is original. Get a white Flite, maybe. OK. Nice point, kind of ironic, when you think about it, older steel bikes helping to sell newer steel bikes. I know a guy who followed that exact model: built an Ironman, then bought a Soma frame and built that. Welcome to the forum. Take an '89 Ironman Master, and get it cleaned, lubed, true and tension the wheels, and adjust it. Or put modern components on it. 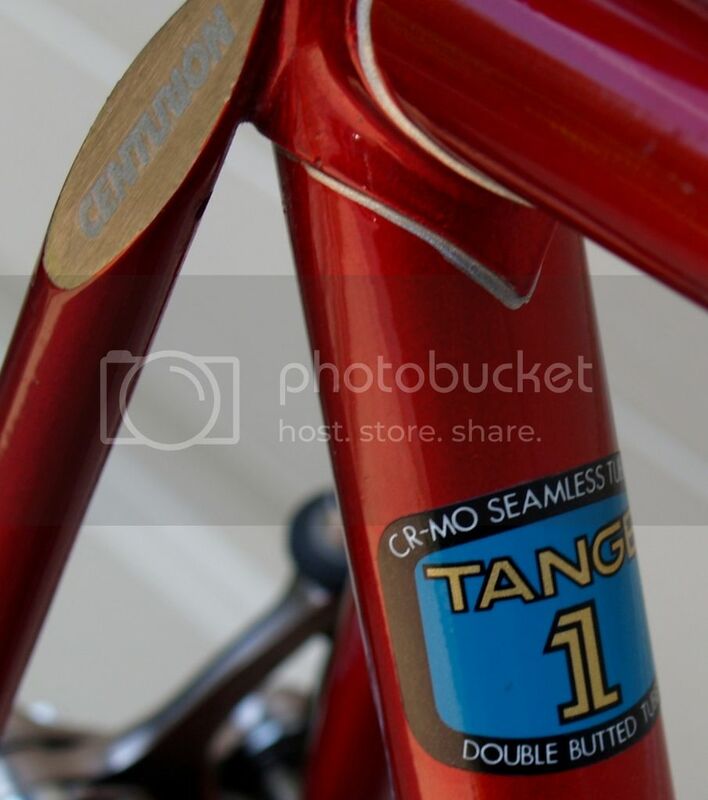 Then, compare its all-around competence to an '89 Pinarello Montello, or an '89 Cinelli Super Corsa. I have, and don't consider it mid-level any more. In my opinion, the only better all-around frame I could have is an Ironman clone made of Ti. And someday, I'd like to hire that done. Not exactly sure what I'm going to do with it. 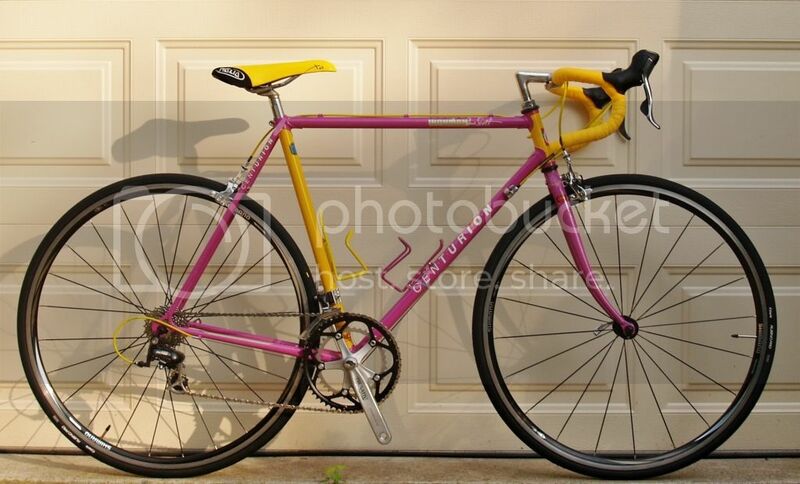 Had intended to use the groupset on another bike and sell/resto-mod the frame, but also have a virtually NOS 600 SIS RD and shifters, so may just upgrade this and use it as a Sunday Ride With The Wife bike. What you do with it is your business, but don't sell the bike short. Tune it up, make sure the brake pads and tires are still good and replace if necessary, and take it out on your normal rides. Unless you have a lot of hills where the 42t small ring won't be much help, you'll find you'll maintain the same speeds you do on your other bikes. 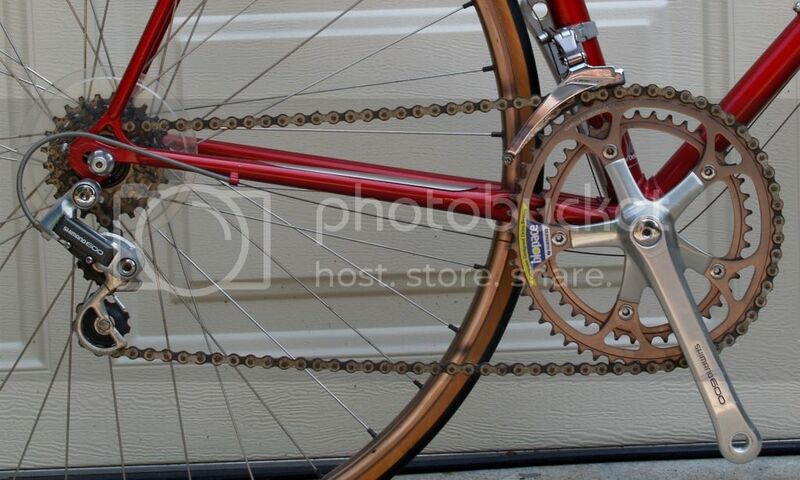 A lot of us have upgraded these to current (or recent) drivetrains - I've got nine speed Tiagra 4500 compact crank, brifters and FD, with an Ultegra 6500 RD, on my '87; found a set of used 600 hubs and re-built the original rear wheel with the 600 hub and current freehub, and that bike is slicker than snot on a doorknob. Then again, if the Mrs. is a Cat 2, your original plan would work fine! Oh, yeah, I'm aware of what these can be made into. Check out the Miami Vice at the top of this page that I finished a couple of weeks ago for a customer. 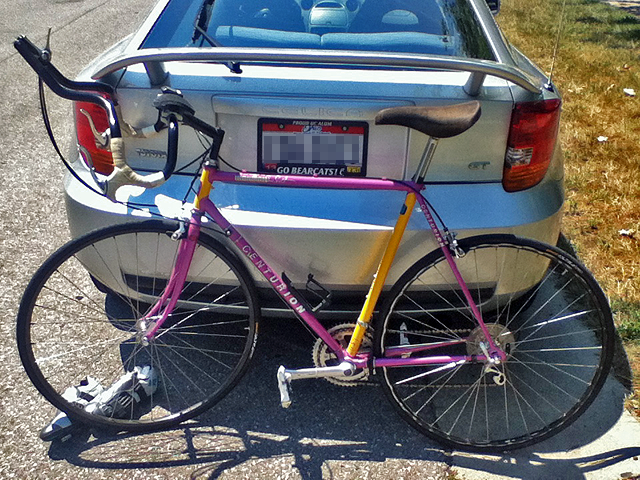 Mrs. is partially disabled, and our Sunday rides tend to be more like 5-6 mile jaunts around the neighborhood, so I usually keep one vintage-y 6 speed bike around for those. She's working up to do the 28 mile loop in the Tour du Port in Baltimore at the end of September. That would be the longest ride she's ever done. A real trooper, that one. After some years of casual searching, I finally landed an Ironman in my size for only 80 smackers. The original Nitto bars were flipped and chopped and the 105 group was super haggard, so I juiced it up with a complete tri-color group and white turbo saddle. The ride is fantastic and the graphics and color scheme take me back to that special place where everyone carried a Trapper Keeper and played Jazz Fusion on their Keytar. Not exactly sure what I'm going to do with it. 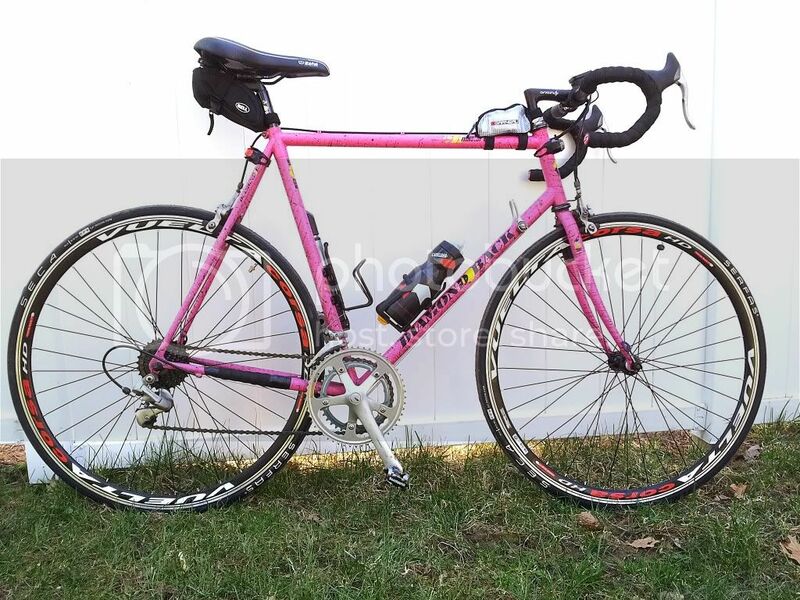 ....Had intended to use the groupset on another bike and sell/resto-mod the frame, but also have a virtually NOS 600 SIS RD and shifters, so may just upgrade this and use it as a Sunday Ride With The Wife bike. Beauty. Much better shape than mine, which is still in the touchup phase. Very nice. The quickness of the later frames, a little bit smoother, which I think is due to 1/2 degree of geometry change, but I do not know for sure. The 85's were Tange 1 upgrades to the Tange 2 Comp TA, and I can't wait to get mine on the road. 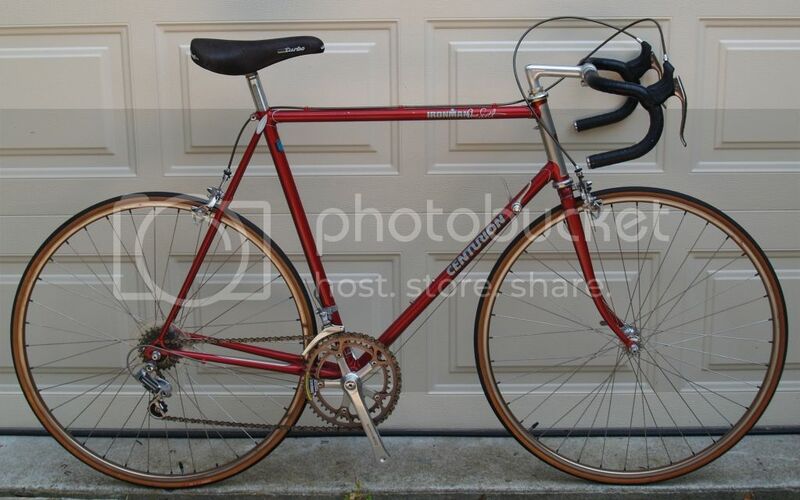 It's going to be my century bike. Last edited by RobbieTunes; 08-05-12 at 11:18 AM.